“Do your best.” Where have I heard that before? With those short three yards of open floor we found the joy of the game was far more important than collecting statistics. It wasn’t that every play wasn’t perfect. It was that each play could be perfect. That’s what inspired us at that very early age. And a few years later, when my brother and I could understand, our father would remind us to plan ahead. Today we now know this as defining the “critical path” to success on any business project. Back then, and in football terms, it meant running a specific sequence of plays. We knew sometimes we could execute those plays perfectly and, other times, well, at least we tried our best. There were times, however, when we planned on a play and walked up to the line of scrimmage only to discover the play would never work given the way the defense was lined up. Now, through the years, these three principles – “Do your best,” “Plan ahead,” and “Be prepared” – worked their way into the very fabric of my brother’s and my values system. This, I think, is what my father had planned all along beginning with those first days running on the cool linoleum of the finished downstairs rec room. Likewise, he trusted us to pass on that same creed to our children. And while we’ve certainly done that, in this particular missive I’d like to focus on one member of this next generation in particular. My nephew Sam Carosa recently celebrated his attainment of Eagle rank in Boy Scouts. This rare achievement requires those three axioms my father passed down to us, and is a testament to my brother successfully passing down those values to his son. There are those who drive along the journey of life simply to get to the next milestone. Then there are those few others who are driven to make life a journey. These people are happy to recognize those very same milestones, but know they are merely passing signposts pointing to a greater destination – a greater destiny. Sam is one of these people. Sam has a voracious appetite for trying new things. What’s more, he’s immune to an obstacle too many succumb to – the fear of failure. He expects to accomplish – and have fun at – any variety of adventures. And this he has done – especially the “fun” part. He’s even added a corollary to the “Do your best” maxim. Some might say it’s the familiar “If at first you don’t succeed, try, try again,” but I say it’s something more compelling. While recognizing the need to “do your best,” Sam follows that with the sincere question: “Why not the best?” It’s a phrase that induces one to attain greater heights. And, knowing Sam, this tenacity isn’t the result of some robotic need to punch a ticket, but for the very real thrill of victory, the kind of thrill mountain climbers experience when finally reaching the peak they have been striving for. There are many mountains in Boy Scouts. Sam has shown no fear in tackling these mountains – whether real or figurative. His energetic enthusiasm propelled him to become a top popcorn salesman as a Cub Scout. Like any experienced businessman, he developed a marketing strategy that included regular distribution routes, a consistency in process, and a friendly attitude that both built a broader customer base and retained existing clients. And when circumstances threatened his well-honed system, Sam effortlessly went to ‘Plan B,’ eventually becoming one of the local Boy Scout Council’s top popcorn salesmen year after year. Boy Scouts doesn’t just have many mountains. In fact, they offer many ranges of mountains. And while it is not incorrect to say Sam’s drive towards earning his Eagle rank exemplifies many of the values passed down from father to son to grandson, there is one better example. You see, Sam not only climbed the mountain to Eagle, but, along the way, he surmounted several other mountains. In fact, you might say conquered an entire mountain range. Last Thursday, on the placid waters of Waneta Lake at Camp Gorton just outside of Dundee, NY, Sam waterskied for several minutes; thus, complete the final requirement for the one remaining merit badge he had yet to earn. 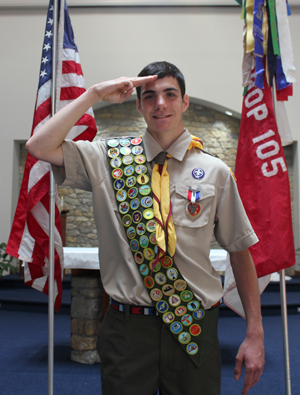 During his scouting career, Sam has earned all available merit badges – 141 in total. This total includes four “historic” merit badges that had previously been retired but brought back for one year only to market the centennial of Boy Scouts (2010). The quest for this last merit badge exemplifies the principles of “do your best,” “plan ahead,” and “be prepared.” You see, the final requirement calls for the scout to make several maneuvers while water skiing. Now, I don’t know if you’ve ever water skied, but it’s sort of like riding a bike. Once you learn, you can’t ever imagine not knowing how to do it. While you’re learning, though, it seems like it’s impossible. At Camp Gorton, Sam tried once and flipped. He tried a second time and flopped. At this point, the instructor took his father aside and told him Sam probably wouldn’t pass the requirement. He said it normally takes a week’s worth or more of training before a boy could master water skiing. Nonetheless, the instructor said he’d give Sam one more chance after all the other boys had finished theirs. My brother figured he had time, so he went to buy a bottle of water at the food shack. There he overheard other fathers saying their sons had passed all the requirements – except for water skiing. And they had been there for the entire week. (Sam only arrived that morning.) Like any father would, my brother grew anxious, worried Sam would finally meet his match in his mission to secure every merit badge. In the 116 years of scouting, only 271 boys have been confirmed to have earned all available merit badges. That Sam has now joined this rarified group is a tribute to his values, the values of his father before him, and the values of his grandfather before him. And to those valued principles, he has shown us all the value of having fun.